A wonderful photo. can anyone name the horses and the men? I remember this photo being taken. 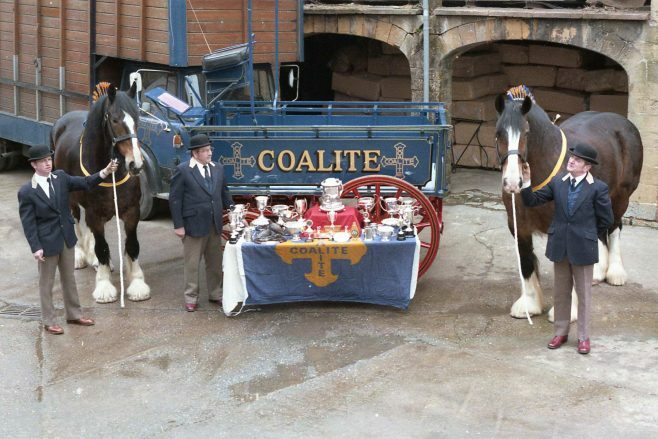 I was there on the day, my children’s ponies were stabled at Debdale Hall at the time the Coalite Shires were there.There was another Shire horse also part of the Show Team called Viceroy. I have quite a few photos of them both at the stables and at shows. And Laurie whittle (right) father and son), pat has since passed away. The horses names were Victor on the left and Valiant on the right. They were sold off when Coalite smokeless fuels shut down in the early 90s. Sorry Pam we cannot give you permission to re-use this CHAD image because of copyright. Why not suggest to your friends on Face Book that they look at this page on our web site. If I could share this image on facebook, I am quite sure I could get some great answers for you. I think I know a man who knows a man…. (you know how it goes!!) 😉 Any suggestions on how to make this happen? The Coalite shires and cart were a lovely sight, especially at carnival times and such like. They where stabled behind the old Debdale Hall recovery hospital, or whatever name it has been given these days, I believe. Whatever became of them I wonder, does anyone know?